Seeing Moscow Ballet’s Great Russian Nutcracker is a Christmas tradition for families since the first North American tour in 1993! The 2016 tour runs from November 6 to December 30 in over 100 U.S. and Canadian cities. 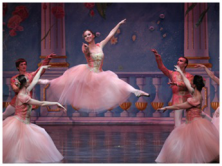 Moscow Ballet’s Christmas production of the Great Russian Nutcracker will be in Asheville, NC at the Thomas Wolfe Auditorium at US Cellular Center on December 4, 3:00 p.m. matinee. Tickets go to www.nutcracker.com/buy-tickets.